I often have a need to identify the month-end date relating to a particular transaction during the month, i.e. 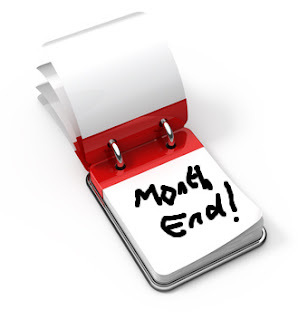 we have the date of the transaction and need to return the date of the month-end. NB: Most businesses in my experience tend to use calendar months for accounting periods these days, however some (particularly in manufacturing) still have month-ends on a particular day of the week. My tip below will only work for calendar months, but I may cover irregular month-ends in a future post (hint, you will need VLOOKUP). Another NB: It has been pointed out to me by a number of readers (see James Travers comment below) that there is a quicker solution than that outlined below for users of Excel 2010. It uses a function which I didn't know was there as I didn't need it, having an approach that served me well in earlier versions. In Excel 2010, you can use =EOMONTH(A1,0), where A1 contains the transaction date. The method below is still worth knowing as you will need it if a file has to be accessed by earlier Excel versions. It also uses a number of techniques for manipulating dates that you can use for other purposes. Here we can use an interesting and very useful feature of the DATE function, along with the YEAR and MONTH functions. so =DATE(2012,7,16) returns 16th July 2012 (in whatever date format you have set for the cell). The YEAR, MONTH and DAY functions work the other way, in that they pull out the year, month and day numbers respectively from a date, so if cell A1 contains the date 16th July 2012, =YEAR(A1) will return 2012.
which would return 25th July 2012. DATE(2012,8,0) returns 31st July 2012. =DATE(2012,15,25) returns 25th March 2013. If you enjoyed this post, go to the top left corner of the blog, where you can subscribe for regular updates and get your free report "The 5 Excel features that you NEED to know". Well spotted. That function isn't there in earlier versions of Excel and I haven't looked for it in 2010, as I didn't need it, given that I had a solution that worked. I will amend the post to reference this. EOMONTH is in my version of Excel 2007 as a standard feature. It has actually been around quite a while. In earlier versions, you needed to activate the Analysis TookPak via the Tools menu in order for it to work. EDATE works similarly for moving a cell date forward (or back with a negative parameter) a given number of months. I've since found out that it is in the Analysis Toolpak in Excel 2003. However, as I am often developing a spreadsheet to run on multiple versions of Excel for clients, the more I stick to standard features the better. I couldn't agree more. In pre-2007 days, I lost count of the number of times I had to remind users to activate the Analysis TookPak when they encountered #NAME? errors. If we put the weekend issue aside, then if the date we are referencing is in cell A2, the formula =DATE(YEAR(A2),MONTH(A2),25) would work. What we need to do to deal with the weekend is replace the 25 with a nested IF statement that returns 24 if the 25th is a Saturday, 23 if the 25th is a Sunday, otherwise it returns 25. We can use the WEEKDAY function to return the WEEKDAY of a date. will return a 7 if the 25th is a Saturday and 1 if it is a Sunday. We now have all of the building blocks we need.